Over the weekend, we decided it was time to tackle some of our summer yard projects that we had purposefully been avoiding. We were able to use weather, soccer tournaments, graduation parties and in my husband’s case, fishing, as distractions or reasons that we hadn’t started our projects. The truth is we were simply overwhelmed by some of the projects and not sure where to begin. The two scary projects involved cleaning green mildew yuck from our deck and from the fieldstone on the walls on our front porch. We live in a wooded area and the sun isn’t able to reach those areas to dry them up after it rains – and then slowly the green yuck begins to appear. We knew how to get rid of the green yuck. We’d done it before – some bleach, some water and a lot of scrubbing. We just weren’t looking forward to spending the hours and hours and hours we thought it would take to successfully remove it. Summer doesn’t last that long in Wisconsin. We want to spend it having fun, not scrubbing. After some discussion, we decided that what we really needed for this job was a power washer. We asked around and found that none of our friends or neighbors had one to lend us so we decided that we should just buy one. After all, we’re not planning to cut any of our trees down so the green yuck will be a recurring issue. And that’s what we did. 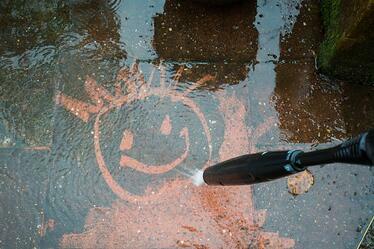 We bought a power washer. I have to say, it is a very fun and useful tool to have around. The kids love to help when they can use the power washer. Our deck, siding and rocks look brand new. It took less than five minutes to clean the rocks and less than an hour to do the entire deck. I am amazed at how well it worked and shocked that we hadn’t thought of this sooner. As I thought about our weekend and the week ahead, I started to think about my blog topic for this week. I had several ideas but needed to select one to finalize. Content creation had made its way to the top of my list. It was then that I realized that for many small to mid-size B2Bs content creation is a lot like my scary yard projects. Knowing how to do it isn’t necessarily the issue. It is the dread that can be felt as you think about the time it is going to take to do it right. There is an approach you can take that will help alleviate the dread. It begins with your existing content. Every organization has content whether it has been implementing an inbound approach for several years or if it is just getting started. Many times existing content is overlooked as a source for new content. Used with your overall content creation plan, it can be the quickest and easiest way to feed the content monster. Here are five ideas that will help you make old content new again. Brochures are a great source of information and content ideas. Every organization has them - either newly created or several years old and only available in a printed version. One way to use brochures to create new content is to create pages for your website using text from brochures. For example, at my last job, I found printed copies of brochures that were more than 10 years old. The brochures were definitely outdated from a branding perspective but the nuts and bolts of how the product worked were explained better in that brochure than in any current content we had. From our research, we knew that at least two of our personas were always looking for that type of technical information. The brochure provided the information we needed to create a new page on our site. Another way to use brochures, particularly old brochures, is to scan and post them as a “Throwback Thursday” type of post. Long-time existing clients enjoy the nostalgia and new prospects see just how long you’ve been doing what you do. It is easy to turn an existing case study into a new piece of content. One way is to recreate the case study as a SlideShare. A SlideShare version may actually allow you to use more photos and graphics and also tell more of the story. Make sure you promote your SlideShare on social media. Some case studies can also be turned in to an infographic or simply rewritten as a blog post. Sales presentations are rich with content. Some of the best bottom of the funnel content can be found in sales presentations. As a marketing professional in the A/E/C industry, I created many sales presentations. Some of our best graphics, process explanations, case studies and overall organizational information were included in these presentations. Everything from blog posts to SlideShares to web pages can be created from sales presentations. Another way to use old blog posts to create new content is to turn numbered posts into individual posts. Breakdown an individual point or two, add a few more details and you’ll have another new post. Blog posts can also be used to create ebooks. Identify posts on a specific topic and reorganize them to make sense as a comprehensive ebook. Use the ebook as premium content and promote it using social media. Webinars are a great way to engage with your prospects. Make sure you record them and make them available as premium content on your website. Existing webinars can be easily turned into new content. Simply transcribe the webinar and make it a whitepaper or even a blog post. In some cases, you may be able to get multiple posts from one webinar. We’ve been using this tactic at Imagine and have always encouraged our clients to do the same. Don’t let content creation be the green yuck or scary project in your marketing life. With a little bit of “power washing,” you can turn your old content into something that looks shiny and new and engages your buyer personas in a different way.